How often do you all shop for vegetables, milk, bread etc? I say once a day!! I am crazy about stuffing my pantry with all the things (not) needed. I want my fridge spilling out vegetables & fruits & my cupboards filled with all flours & lentils. Same is the case with my wardrobe too.., Okay, that is a story for another day.. I always buy a big pack of black eyed beans & hardly use it. 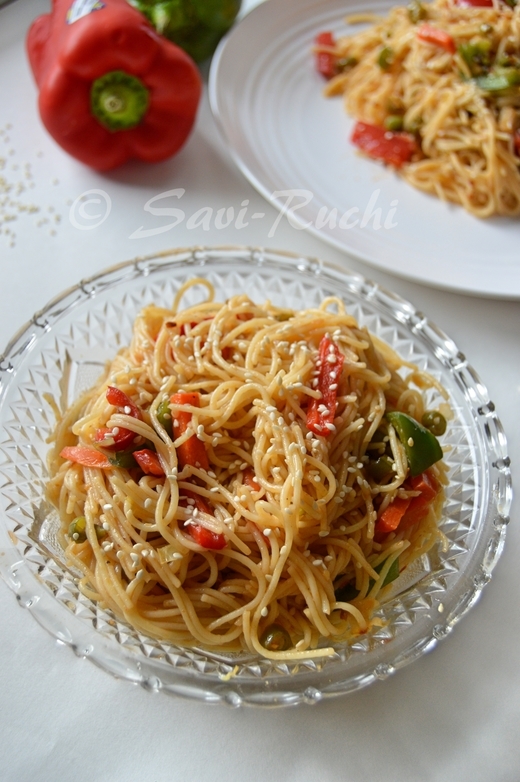 I add it with sambar, once a bluemoon make this pulao & this pasta. This is one bean that takes a backseat. It is only used during SOS. Now that we are shifting to a new home, I had to clear my pantry & hence soaked a large amount of this beans. I got beautiful sprouts too. But, didnot know what to cook. Hence, googled the recipes for black eyed beans & settled down on this vade from Shubha. Vade was absolutely delicious, I wonder why did I not try it earlier! It is crunchy on outside & soft on the inside. It has a very distinct taste. I thought of taking step-by-step pictures & then posting it, but could not resist sharing it immediately. I tried making patties using sprouted black eyed beans & used it instead of cheese/paneer or veg patty for burger. Will post that recipe sometime. Wash the sprouts & drain the water(No need to pat them dry). Scoop out the coarse paste. Add finely chopped onions, chopped coriander leaves, cumin seeds, rice flour, salt to the paste & mix them well (Paste will be something similar to the cutlet batter). Make medium lemon sized balls. Pat each ball into 1cm thick patties. Heat oil in a broad kadai/pan. When oil is hot, reduce the heat. Drop the patties carefully in the oil & cook on a low heat(This is very important! !, else it will be cooked from inside) on both sides till the vadas turn golden brown. Serve it hot/warm with a dip of your choice. Instead of sprouted beans, soaked or canned beans could be used to. Be cautious while adding salt as canned beans might contain salt. It is very important to deep fry the vada/fritters on low heat to ensure proper cooking of the patties. Do not add water while making a coarse paste. I think, I have adpated well to my in-laws food habits. Isn't it same for all the ladies? Alas, wish our hubbies did the same too!! Though me & my hubby are both from Karnataka, our staple food was totally different. His staple food being rosematta rice porridge & mine ragi mudde(finger-millet balls) /ragi rotti(finger-millet bread). After marriage, I tasted the rosematta rice porridge and now, I like it too. But, my husband still doesn't seem to like ragi mudde (finger-millet balls). However, I have transformed him to eat fingermillet dosas to ensure that he doesn't miss out the benefits of this divine grain. These are super soft dosas that remain the same even after the dosa reaches room temperature. Eat these dosas hot, warm or cold.., you will love them. Soak the urad dal & sago separately for 4-6 hours. Grind the urad dal & sago together until very smooth & fluffy. Add ice cold water while grinding the urad dal (when using mixer/mixie/blender). Ice cold water controls the heat of the motor to be passed to the batter, thus making the batter more fluffier. Scoop out the smooth batter in a large bowl. Add the rice flour, soybean flour, finger miller flour to the batter & mix well. Add a cup of water to achieve the consistency. Ensure no lumps are formed. Allow the batter to ferment for 6-8 hours. Add salt to the batter just before preparing. Heat a griddle, spread the dosa batter(like a pancake, donot make it thin) & sprinkle few drops of oil. Cook on medium heat for 30-45secs. Flip the dosa & cook on the other side too. Serve it hot with a curry of your choice. BTW, here is another version of Ragi Dosa. Last week, lapsi and this week, khichdi. What next? undhiyu, kadhi..may be :D. Anyways, coming back to khichdi, it is a dish similar to Pongal and bisi bele bath. This dish is primarily a mix of rice and lentils. I say proudly that I experimented a lot for this khichdi & now I make it very close to what we get in Gujarati resturant here. There are many ways khichdi is prepared. In some Gujarati homes, khichdi is prepared using only yellow moong dal. Wash the split green gram thoroughly & soak it in water for 1-2hours (More time you soak, faster it gets cooked). Wash the yellow moong dal & soak it or 30mins. Heat oil + 1 tbsp of ghee in a large vessel. When oil is hot, add cumin seeds. When cumin seeds turn golden brown, add bay leaf, cinnamon, clove, cardamom, pepper powder & saute till the spices leave a nice aroma (takes around 20-30secs). Add curry leaves, green chilli, turmeric & asafoetida & saute again. Drain the water completely from the lentils(both split green gram & yellow moong dal). Add the lentils to the vessel & saute for a minute. Add the water & allow the lentils to cook. Meantime wash the rice thoroughly & let it soak for 10-15minutes. When the lentils are half cooked, add the soaked rice & mix them well. Cook the lentils + rice on a medium heat. When the rice is almost cooked, add salt & gently mix. (Adjust the consistency of khichdi by adding a cup of more water, if required). Finally, add the remaining ghee. Mix well & cook for a minute or two. Turn off the heat & serve it with a raitha or Gujarati kadhi. We prefer the khichdi to be semi-solid, hence I add more water. Do adjust the consistency according to your family needs. I have tried preparing this khichdi using a pressure cooker, but somehow was never satisfied with the result. Hence, I strongly suggest you to try stove top method. Remove the cinnamon stick, bay leaves from the khichdi before serving. I'm sending Lapsi & Gujarati khichdi for the event "Flavors of Gujarat" hosted by SimplySensationalFood. First of all " happy bhimana amavasye/bheemeshwara vrata to all Kannadigas". Yes, this year Bheemeshwara vrata falls on 9th August. I always feel that there is a similarity between the Gujarati & the South Canara vegetarian food. Both are sweet, sour & spicy (like the menaskai, sambar, rasam etc). May be that could be one of the reasons why our family loves Gujarati food. The other reason being, the limited usage of garlic & onion in Gujarati Jain food. Last year during our parents & in-laws visit, we took them to one of the Gujarati restaurants here. They enjoyed the meal thoroughly & most importantly they were all tasting the Gujarati meal for the first time. My mom being off to garlic & onion also enjoyed eating their paneer burji, khichdi, phulkas, chaas & what not! My mom-in-law was fascinated by a dessert served there & wanted to know how they prepared it. We had no clue about it & when asked about the same, we were told it is an authentic Gujarati dish made using broken wheat. Add 2 tbsp clarified butter/ghee & broken wheat to a pressure cooker. Saute the broken wheat until it leaves a nice aroma & it changes it color (the broken wheat will go a shade or two darker). Add the water to the sautéed broken wheat, close the pressure cooker lid & cook the broken wheat for 2 whistles. Turn off the flame. When the pressure goes, open the cooker lid(cooked broken wheat needs to be hot), add the sugar, cardamom powder, remaining ghee & mix well. Close the lid & let the mixture sit for 10mins. Lapsi is ready to be served. After adding the sugar to the cooked broken wheat, the mixture will ooze out some water. But, there is no need to worry. During the resting time, it will absorb the water. The same can be prepared without using the pressure cooker too. Repeat the same procedure on a large non stick pan(Keep stirring once a while to avoid sticking of the broken wheat to the pan). This is a recipe from one of the Kannada channels. My mom-in-law & my mom have collected huge number of recipes(shown in Kannada Channels & from Kannada magazines). This time, I brought few recipes photo-copied from their collection. This is one of those recipes. Usually Masala dosas are filled with potato stuffing while plain dosa does not have the filling. It is crisp on the edges & soft in the center. Again a Karnataka speciality! * Increase the rice quantity to 5 cups if using parboiled or idli rice. Wash the rice, urad dal, channa dal thoroughly & soak them in water for 4-5 hours. Grind together the rice, urad dal, channa dal, puffed rice to a smooth batter. Add the buttermilk instead of water while grinding (Batter should be like a thick milkshake). Scoop out the batter & allow the batter to ferment for 6-8hours (depends on the outside temperature). Batter would have raised by 1-2 inches after fermentation. Add salt & mix the fermented batter. Heat a griddle. When the griddle is hot, add a ladle full of batter to the center of the griddle & spread the batter clockwise using the back of the ladle. Add 1/2 tsp of oil,cover a lid & cook the dosa on a medium heat for 30secs. Remove the lid, turn the dosa & cook the other side for 10 secs. Remove the dosa from griddle. Repeat the same for the remaining dosas. Serve the dosas hot with a chutney/dip/side dish of your choice. Rice flour could be replaced with ragi flour/finger millet flour for health benefits. I have tried preparing this dosa with both rice flour & ragi flour. Both of the versions taste equally good. You a nicer crisp on the outside of the dosa when rice flour is used. No need to soak the puffed rice, puffed rice is added while grinding. One more version of paper plain dosa can be found here.